Research shows that children are more likely to gain weight during the summer months. Use these tips to avoid weight gain during summer! When you think of kids and summer, what are the first things that come to mind? How about the beach, swimming, games, ice cream, catching fireflies, and summer camps? All of these things (well, except for ice cream) imply being physically active; however, reality paints a different picture of what the majority of children are up to during the summer vacation months. What does the research show about child weight gain? Per the CDC, obesity rates have more than doubled in children and quadrupled in adolescents over the past 30 years. Many people think that school nutrition is to blame. However, more recent research has been pointing the finger elsewhere. Researchers have categorized a child’s year into school months and vacation months in order to investigate exactly when children were gaining the most unnecessary weight. Various studies ranging from 2007 to 2013 have shown that the rate of weight gain in children tends to double during the off-months, and decrease or return to normal during the school year. This observation of accelerated weight gain is a multi-factorial mystery that begs follow-up questions. Researchers have speculated as to the potential causes by noting the differences in environments. The school environment is fairly structured, with healthful meals at consistent times. 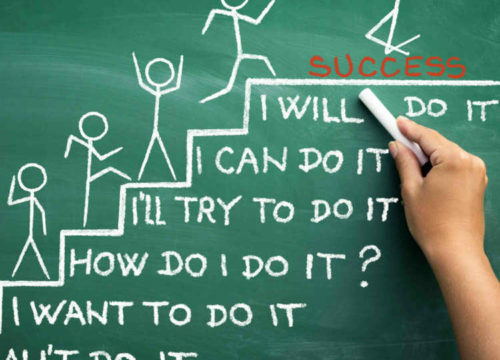 Schools provide children with activities and opportunities for exercise, and they are directed to a lifestyle that demands a consistent sleep schedule, as school starts at the same time every morning. On the other hand, unstructured vacation months allow for sleeping in and welcome potentially unlimited access to unhealthy snacks. 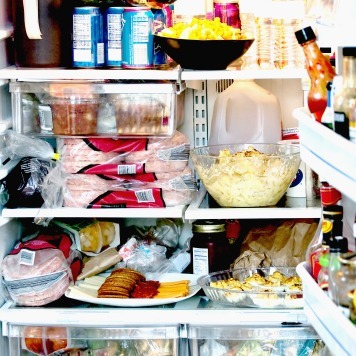 This can lead to additional calorie consumption, especially when children are bored. Unstructured or less carefully monitored environments such as vacation times have been correlated with accelerated rates of weight gain for adults too (as you probably know)! 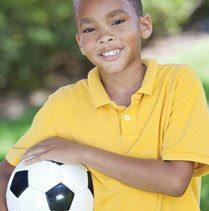 See Tips for Keeping Your Kids Fit and at a Healthy Weight. Although the statistics show that children tend to gain more unnecessary weight during summer vacations, they are not doomed by the stats! 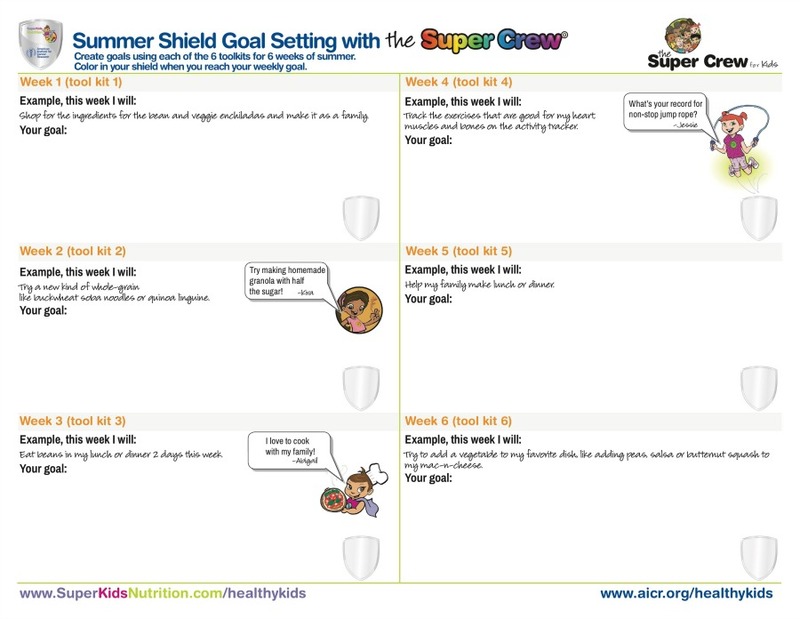 By understanding the factors that help children maintain a healthy rate of growth during the school year, parents can guide their children through a healthful, active, and fun summer vacation. What can parents do to help prevent weight gain in their child? Enforce regular bedtimes. Kids need their sleep to avoid excess weight gain and to recharge their bodies so they can grow healthy and strong. Offer nutritionally dense meals and snacks. Remember to choose more real, whole foods and less overly processed options. Think, “apple instead of apple sauce,” “baked potato instead of potato chip” or “nuts in place of Nutella.” Try to choose real whole foods at least 80% of the time, saving 20% for summer splurges. Then aim for 90/10. Keep healthy snacks out and available and make sure fruits and vegetables have visual appeal. Experiment with shapes, sizes, textures and temperatures to make fruits and veggies more fun. It really does work! If you can send your child to summer camp, that’s an excellent way to keep them active and give their schedule structure. If camp is not an option, be creative and come up with your own activities. Hit the beach, have a dance party, explore a new hiking trail, go for a bike ride, play outdoor games, do a “house cleaning” or a “house makeover”, make post-dinner walks a “family thing”, or get kids involved in making fruit kebabs! Try to incorporate some physical activity into each day. See activities that are fun cool and out of school. Here’s to a happy and healthy summer! 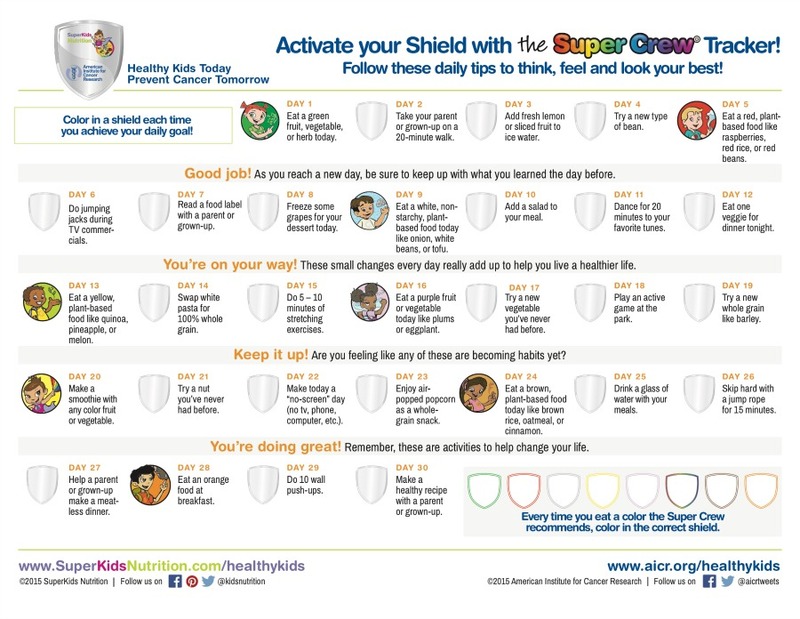 Check out SuperKids Nutrition and the American Institute for Cancer Research, Activate Your Summer Shield program for home or camp full of fun free activities featuring the Super Crew!